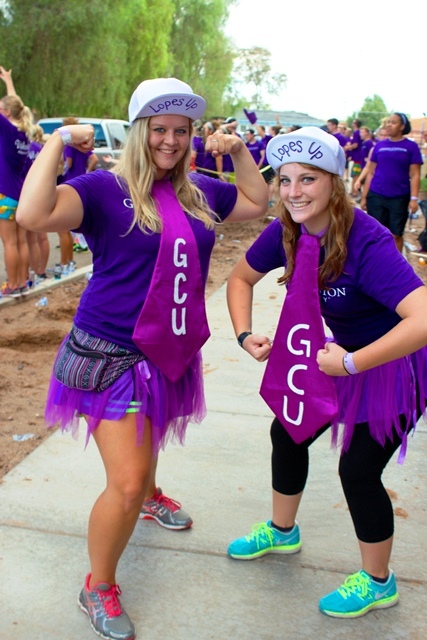 After two days of intense luggage-lugging, cheering and warm receptions for incoming students, Friday’s Move-In had a lot of GCU spirit to live up to. 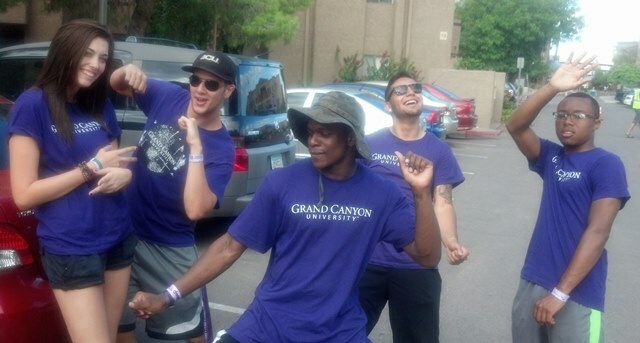 GCU Move-In volunteers on Friday were pumped up by a photo-bomb episode with President and CEO Brian Mueller. Although the day proved more relaxed than Wednesday’s and Thursday’s events, about 600 students, mostly freshmen, moved into new Ocotillo Hall on the far northeast corner of campus. 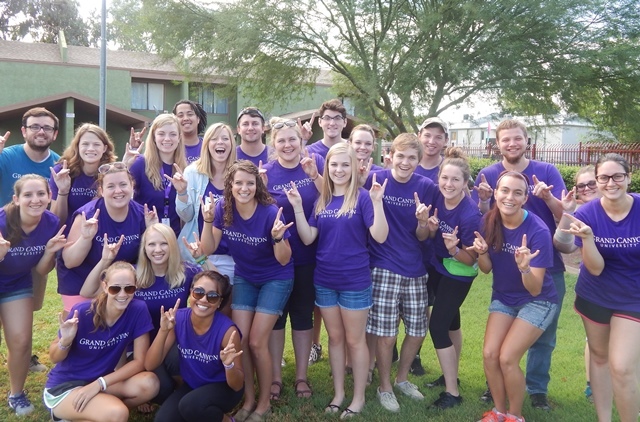 In addition, dozens more new students moved into the new Papago and Mesquite apartments and the North Rim Apartments. The 928-bed Papago Apartments is still partly under construction. The residential floors are completed, but crews are putting the final touches on office space for Student Affairs, recreation centers, a swimming pool and courtyard walkways. Papago is expected to be completed by late September, said Rich Oesterle, who oversees GCU’s campus development. Despite the construction, residents such as junior Anthony DiMaria, a resident assistant in the “Big Papago” building, were excited to be set up in new apartments with built-in kitchens and other amenities. The activity level at Mesquite Apartments on Friday morning was quiet, with only about a dozen upperclassmen expected to move in, said Nate Dodd, GCU’s residential director at the one- and two-story complex a block east of campus. Among the incoming students was Timothy Oakes, a 21-year-old junior from Mesa who is majoring in finance and economics and looking forward to classes starting on Monday. Residential Director Nate Dodd (far left) and members of his welcome crew greeted a small number of upperclassmen moving into Mesquite Apartments on Friday. Many more students will arrive on Saturday. On Saturday, nearly 200 other students are scheduled to move themselves into Mesquite, Dodd said, bringing the total community population to just under 300. “There’s a sense of being off campus, but being close to things, and they like that this has an apartment feel with a full kitchen, washer and dryer in each unit and, potentially, parking at your front door,” he said. The Residence Life folks are always looking for new ways to get newcomers acclimated and connected, and two of their new events this year — LopeLife 101 and The Mash Up — and a new phone app have gotten a big thumbs-up. Five LopeLife 101 sessions were scheduled over three days (the last one is Friday afternoon) to give students the basics of what it’s like to live on campus and also to help them get to know each other more quickly. In previous years, the whole group was herded into the Arena for one monster session, but organizers found that students didn’t connect as much that way. 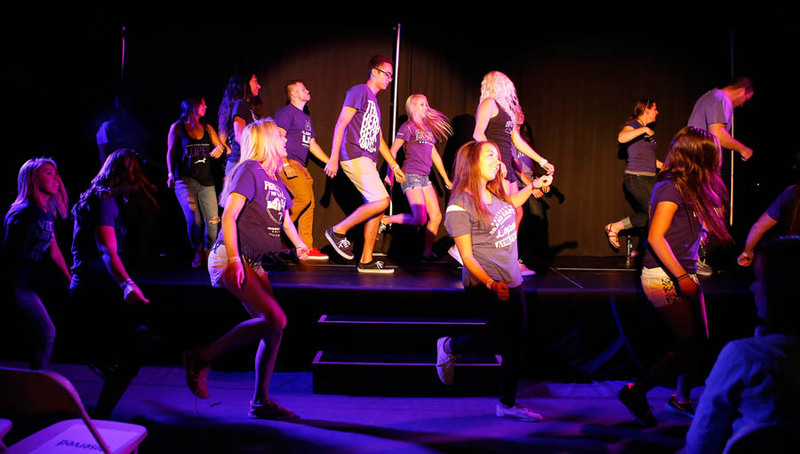 Jeremy Mack, GCU’s director of student engagement, said the new phone app, which can be Googled at “Grand Canyon University Lope Life,” is up and running. It features news, events and other resources, such as dining hall hours and a campus map with a GPS. The new signs on campus offer a nice — and helpful — touch. 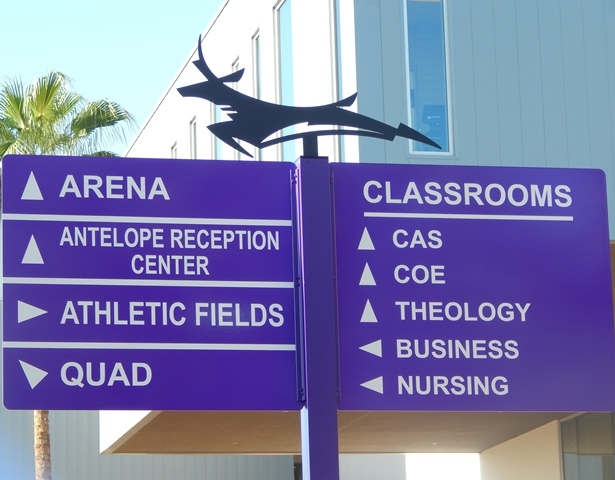 Anyone who’s been around GCU for a while probably pinched themselves a little when they saw those snazzy new purple directional signs that have popped up on campus. You know you’re getting big when you need signs to know where you’re going. Here’s the story behind them: There are six of them, including three on the Promenade. They’re about 8 feet tall, including the Antelope on top. There also are three new campus maps on the perimeter. They measure 4 feet tall and 3 feet wide. It’s the nature of GCU to help the lost find their way, of course, but maybe now that won’t be necessary too often. From left, Kendall Lacivita, Eric Vohs, Chris Beverly, Gio Hernandez and Ryan Dixon show off their dance moves. The pace was a lot slower Friday morning at the North Rim Apartments than it was the previous two days at nearby residence halls, which GCU Luggage Luggers welcomed in some ways but not in others. It was nice to not be carrying things up stairs constantly, but the strain of three straight mornings of early wake-up calls was catching up with them and standing there waiting for the next car wasn’t helping. So what do you do in a case like that? You dance, of course. Gio Hernandez, Chris Beverly, Eric Vohs, Kendall Lacivita and Ryan Dixon heard a song that got their feet going and entertained the group. Afterward, the one-liners were flowing as much as the dance moves as they traded jokes about their various levels of sleep deprivation and their memories of the craziness at Chaparral Hall on Wednesday and Sedona Hall on Thursday. Their favorites: people who didn’t do Lopes Up properly (they’ll learn) and the number of new students who seemed dazed, embarrassed or both as their parents got their Lopes Up or, worse, jumped out of the car to film the whole scene. Of course, aren’t college students always embarrassed by their parents? GCU junior volunteers Danielle Hitchcock and Shelby Gibson stood out like sore thumbs during this week’s Move-In event, which is exactly what they wanted. Student volunteers Danielle Hitchcock (left) and her cousin Shelby Gibson added a little extra spirit to their looks during this week’s Move-In event. The cousins didn’t think the purple GCU shirts handed out to all volunteers “displayed their personality” well enough, so they decided to spruce up their look. After a little thrift shopping, their outfits — complete with oversized purple ties, turned-up flat brimmed baseball caps and purple tutus — were original, wild and extremely spirited. What more could incoming students ask for? Gibson said the outfits made strenuous moving a little more fun. “The day can get long and boring so we wanted to have fun and, plus, it’s just another way to make students feel welcome,” Gibson said. The cousins wore the outfits during all three days of Move-In and said they plan to bring them back for home basketball games. Luckily for other luggers, they washed the outfits each day. 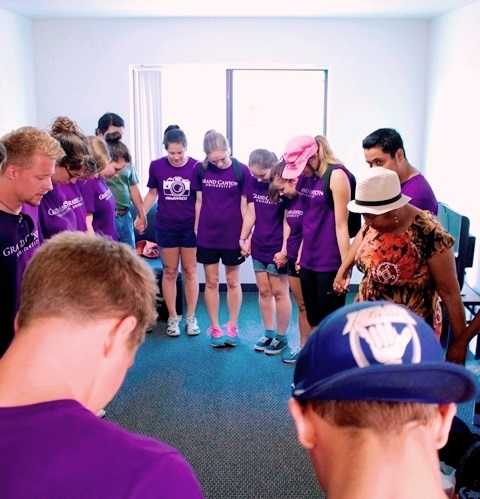 After hauling a carload of belongings to the third floor of Ocotillo Hall on Friday morning, GCU senior Gabriella Garcia and a handful of Servant Scholar volunteers joined hands to pray for incoming freshman Chelsy Kadely. Kadely’s father, Scott, said the simple act touched him more than the reception his family received when they arrived on campus. Servant Scholar volunteers pray for incoming students. Garcia, who has helped lug luggage the last three days with nearly 100 other Servant Scholar volunteers, said her team wanted to welcome incoming students to campus in a way that went deeper than raucous screams and Lopes Up hand signals. She said they prayed for hundreds of students. Freshman Olivia Timmins came a long way to move into Ocotillo Hall Friday, but her family came even further. Timmins’ stepfather, an Army sergeant, was stationed in New Jersey and drove nearly 13 hours to Georgia to pick up Timmins’ mother and sister. They drove 15 hours to Texas to meet Timmins, leaving there after midnight today and arriving in Phoenix this morning. At each stop, he added belongings from each family member to a small trailer he’d hitched to the family SUV. Total trip time: about 48 hours. “My family picked me up at 2 a.m. this morning and we drove six hours straight here from Texas, so it really wasn’t too bad for me. I can’t speak for them, though,” Tillman said.